The Soviets concentrated their field artillery research, development and production on only a few calibers during WWII: 45mm, 57mm, 76.2mm, 122mm, 152mm and 203mm. The first two were antitank guns, the 76 a divisional gun, the 122 and 152mm corps and army weapons, and the 203 an RGVK heavy howitzer. A few stray weapons were used, but these were the primaries. To that end, the Soviets picked fixed sets of ballistics and stuck with them; these meant that any gun with those ballistics could use the same set of ammunition and achieve the same results as any other gun with those ballistics. Ditto the ammunition. The majority of 76.2mm field guns could fire either the 350 series or later 354 series ammunition as could the T-34 and KV-1 with their 76mm guns. 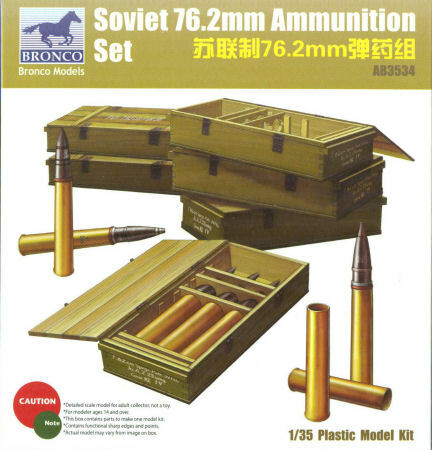 This set offers parts for six cases of three 76.2mm rounds each, but for some reason provides mixed ammunition. Each case comes with one OF-350 high-explosive fragmentation round (J8), one D-350 smoke round (J10) and one BR-350 armor-piercing round (J9). At least as everything here is divisible by 3, you can fix that problem by grouping the rounds in their respective cases. Decals are included with lot numbers for each round and also German case markings for the outside of the cases. Overall while the directions aren’t much help the rounds will go well with any F-22 or ZIS-3 weapon, as well as the Su-76 or a T-34 or KV-1 with a 76.